The cuts are the result of “changes to class sizes, cuts in local priorities funding and other reductions in funding,” Carla Pereira said. The tone from the president of the union representing secondary school teachers, however, was much more pointed. “This is not routine,” Mike Bettiol of the Ontario Secondary School Teachers’ Federation’s District 19 said in a statement. Bettiol didn’t mince words about the impact of the layoffs in the classroom either, saying classes will see higher caps and that offerings with lower enrolments will have to be cancelled as a result. “Students will experience more crowding and less choice,” he said. 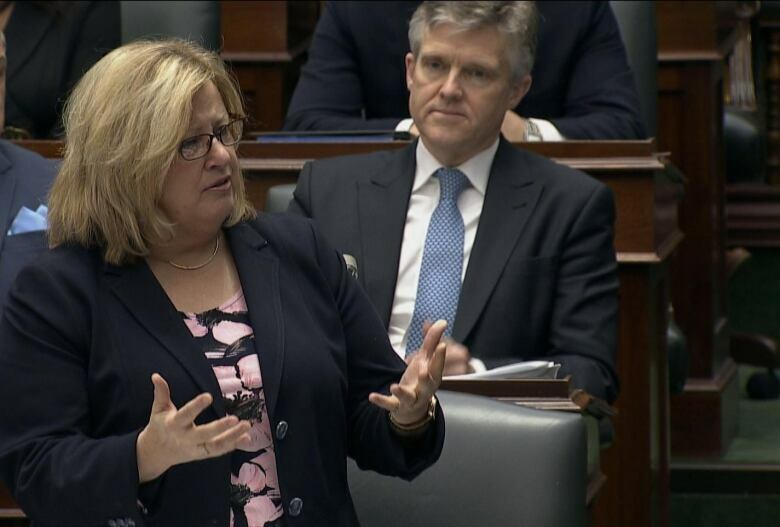 “The Ford government’s cuts in our classrooms continue to erode the quality of our children’s education,” Horwath said at Queen’s Park. “Year in and year out, school boards across this province take a look at their roster, they take a look at how many people are retiring, they take a look at how many people are coming back into the classroom from coaching … That’s what’s happening right now,” Thompson countered. “This is a regular occurrence,” she said. News of the cuts comes less than two weeks after a memo obtained by CBC Toronto revealed the province plans to cut 3,475 full-time teaching positions over the next four years — resulting in a savings of $851 million. Fears of job losses and larger class sizes have dogged Doug Ford’s Progressive Conservative government since March, when the province unveiled its education plan. Thompson has said no teacher in Ontario will “involuntarily” lose their job. Also on Tuesday, Ford made no secret of his position on teachers’ unions, saying they’d “declared war on” the PCs even before they formed government. The premier made the remarks at an announcement in Markham, Ont., where he expressed frustration over the fact that provincial teaching contracts are set to expire August 31, right before the start of the school year — something he said will never happen again under his government. Ford also warned the teachers’ unions not to try to strike.